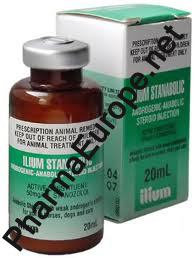 For veterinary application, Upjohn claims that once-weekly doses supply constant levels. It is not sure if that is actually true or not – it might be true in terms of being clinically practical but not literally true. If true, then it may be that the observation of bodybuilders that frequent dosing is required has more to do with a significant dose being required, e.g. 350 mg/week, rather than an actual need for it to be injected daily. Unfortunately bodybuilders often make illogical comparisons, and will conclude that daily injections are needed, since a once a week injection of 50 mg did not do the job! Well, of course it didn't: the dose was too low. For a future article, some urinalysis testing may be performed to come up with some more specific information on this matter, since it is of interest to many.